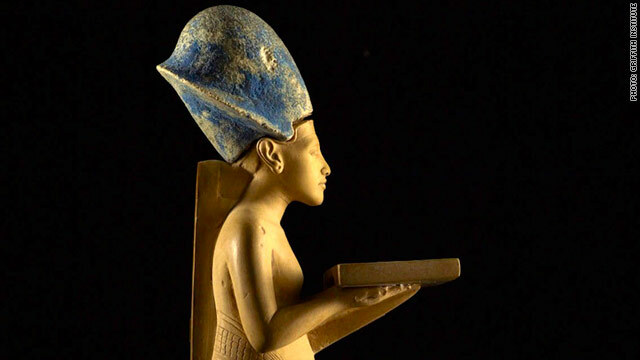 Cairo, Egypt (CNN) -- At least 17 artifacts from the Egyptian Museum of Cairo are missing following a break-in, the country's minister of antiquities said Sunday. The missing objects include a gilded wood statue of King Tutankhamun being carried by a goddess; parts of a gilded wood statue of Tutankhamun harpooning; a limestone statue of Akhenaten; a statue of Nefertiti making offerings; a sandstone head of an Amarna princess; a stone statuette of a scribe from Amarna; 11 wooden shabti statuettes of Yuya; and a heart scarab of Yuya. The discovery that the ancient treasures are missing came after museum staff took an inventory, Zahi Hawass said in a statement. The police and army plan to question people who are already in custody, Hawass said. Hawass earlier told CNN that "criminals" had broken into the museum on the night of January 28, not long after protests against President Hosni Mubarak began in Cairo and other major Egyptian cities. Mubarak resigned on Friday. A number of suspects were apprehended shortly after the break-in, some of them with antiquities in their possession, Hawass said. The army and private citizens fanned out to protect Egypt's museums as the unrest spread. "The Egyptian people are absolutely wonderful," said Jan Summers Duffy, an Egyptologist at the College of Idaho and curator at the Orma J. Smith Museum of Natural History. She said when the break-in was announced that she believed they can be counted on to defend museums and archaeological sites. Another expert said that given the widespread poverty in a country home to so many priceless treasures, it was little surprise that there was some looting. "With 80 million people in a country that suffers from poverty and rising food prices ... you have to expect that some people are going to be desperate and look for any means necessary to try to improve their lot," said Kara Cooney, assistant professor of Egyptian art and architecture at the University of California, Los Angeles, and host of the Discovery Channel's "Out of Egypt." But, she said, for every one of those, there are a thousand Egyptians who will defend ancient treasures. "The people who are best able to protect these monuments are already there on the ground," she said. "... I just have to hope and trust that they're able to do what they can."